Hi all! It’s been a long time since I made a post! 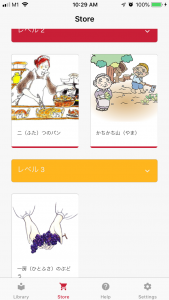 Today I would like to do a review of the Japanese Graded Readers mobile app. 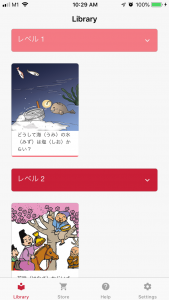 If you’ve been wanting to have listen to stories in Japanese, then this is the app for you. I tried out the app on my iPhone. It contains a couple of stories graded into different levels for your reading pleasure. 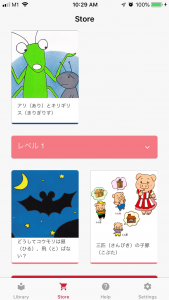 Tap on each story and you will get be greeted with a story blurb in English. 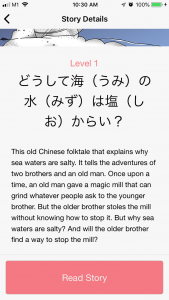 The story is written entirely in Japanese, with furigana provided for easy reading and learning. 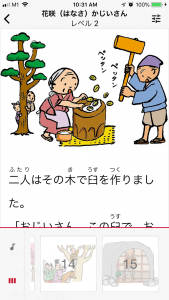 The stories are also entirely narrated by a native Japanese speaker, so you can listen to the story as you read along. Listen to the stories as you read along. 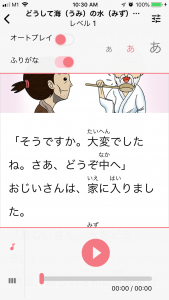 Furigana is provided for easy reading. Each story is split into numerous pages, with an illustration on every page. The audio to text link could be improved. E.g. Highlighting the sentence that the audio is currently on. Or allowing readers to skip to a particular section of the audio when clicking on a word. A word search/dictionary look up option for kanji would be highly appreciated. More stories, and make them cheaper please. The greatest problem I have with the app is the expensive price of the stories. Each story has to be purchased individually, and cost a few dollars, depending on the difficulty level. While I understand that the illustrations and narration costs money, I’d rather go to Kinokuniya and spend a few bucks more for a full fledge book. The only advantage this app provides is the audio narration. Hopefully more stories will be added, together with an affordable “unlock all purchases” option. 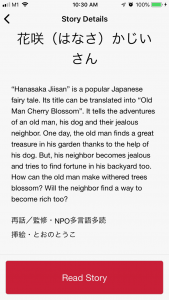 The Japanese Graded Readers app is available on the Apple App Store as well as on Google Play. 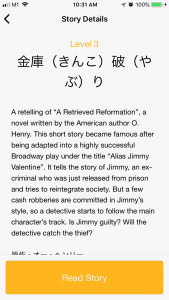 The app is free to download and you get to try out half a story for free. Each story needs to be purchased individually and costs between 3-6 USD. A total of 9 stories are currently available. You can check out more information about the stories/app from their website here. 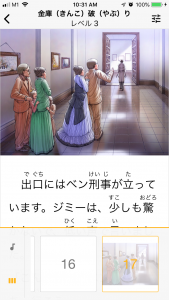 Disclaimer: I was provided coupons to try out three stories within the app. The review and opinions are my own.